Josep Gombau lost two of the starters against Perth to suspension, so Osama Malik, Cameron Watson and Tarek Elrich all got a first start of the season – the latter at left back, pushing Michael Zullo higher up, while Malik played in central defence, and Watson deployed in holding midfield. Ange Postecoglou kept with the same front four from last week’s derby, but Mark Milligan returned from international/injury in place of Rashid Mahazi. Pablo Contreras was suspended, so Nick Ansell started alongside Adrian Leijier. This game was, in essence, all about the Victory getting in behind Adelaide’s back four. This was such an obvious, prominent feature of the match, and resulted in multiple Victory chances. Last week, Adelaide played a reasonably high line, but because Perth sat close to halfway and allowed the central defenders to come forward on the ball, it wasn’t particularly relevant. However, they were incredibly high up the pitch here, sitting practically five metres behind halfway out of possession. It was almost like a deliberate strategy from Gombau, as if he wanted to compress the active playing area into the opposition’s half. With the benefit of hindsight (but even so, predictably), it didn’t work – it played into right into the Victory’s hands, as they always at their best when breaking in behind defenders, rather than breaking down a massed defence (more on that later). It took just two minutes for the trend to become noticeable – Milligan won the ball in midfield, then it fell to Troisi, who immediately played a forward pass over the top for Archie Thompson. A few minutes later, Thompson again made a sprint in behind, but he’d barely travelled a distance of ten metres before moving into an offside position, illustrating how high Adelaide were setting their defensive line. A secondary issue was the Victory’s pressing. Gombau wants his side to ‘play like Barcelona’, to keep their passing short and neat, and the Victory were obviously very keen to close them down quickly, as if to test their ability to play out from the back. In this regard, Mitch Nichols was very important: he prevented passes into Watson, who dropped into defence from midfield, before moving forward to close down the inevitable back pass to Galekovic. Nichols’ partner, James Troisi, shut off the passing angles to either centre-back, meaning unless Galekovic managed to hit an accurate lofted diagonal to either of the full-backs – which he did on a few occasions – he was otherwise forced to go direct. Galekovic’s first touch in the match was instructive: under immediate pressure from Nichols, he attempts to chip it over the top to Elrich at left-back; the pass is overhit and goes out for a throw-in. The Victory’s high-tempo pressing in the opening twenty minutes lead directly to their first major chance – when Connor Pain spurned Archie Thompson’s excellent ground cross. Rather inexplicably, though, that goal was the end of the Victory’s early dominance, because almost completely against the run of play, Adelaide took a two goal lead. It’s difficult to attribute the two goals towards any particular tactical trend, but it’s worth noting that the penalty originated from Steven Lustica finding space between the lines, and being able to find Jeronimo Neumann’s run off the shoulder of Leijier. Under Gombau, Adelaide attackers are always positioning themselves between the lines to receive passes facing the opposition back four – this was a classic example of that. Another noticeable theme of Adelaide’s build-up play under Gombau is the build-up of play down the right flank, and then long, sweeping crossfield balls to the opposite side; this was how Awer Mabil found space to cut inside from the left onto his right foot (a move he attempted repeatedly), leading to Jeronimo’s simple tap-in. Mabil, of course, was only on that left flank because of an injury to Daniel Bowles: Elrich moved to the right, and Zullo dropped into defence. However, this game was still about Adelaide’s high line, and the Victory getting in behind. The wrongly disallowed goal on thirty-five minutes is an excellent example: Thompson breaks in behind Zullo and John McKain, and as we’ve come to expect, the winger on the opposite side, Pain, darts across to provide an additional goal threat. There are countless examples – there was the moment when Thompson was inside the penalty area, but the referee called a foul rather than playing advantage, and the time when Pain was only denied by a brilliant 70 yard sprint and goal-saving slide tackle by Fabio Ferriera. There were two main reasons why the Victory couldn’t convert their chances: firstly, Galekovic swept up in behind his defence excellently, and secondly, the Victory were repeatedly caught offside – more of a consequence of the poor timing of runs rather than because of a well-set offside trap. The contrast between this and the derby is stark – caught offside eleven times compared to none against the Heart. Key to the Victory’s repeated exploitation of the high line was the positioning of the two no.10s. It’s particularly instructive to compare this to last week’s Melbourne derby, when John Aloisi asked the second bank in midfield, with David Williams and Mate Dugandzic tracking back, to sit just ahead of the back four and block off passes into Nicholls and Troisi. As a result, neither of the playmakers managed to get any time and space on the ball in between the lines. It was a completely different story here. The format of Gombau’s midfield triangle – with the point facing backwards – meant the two advanced players, Lustica and Cirio, naturally moved forward to pressure their direct opponents, Milligan and Leigh Broxham. 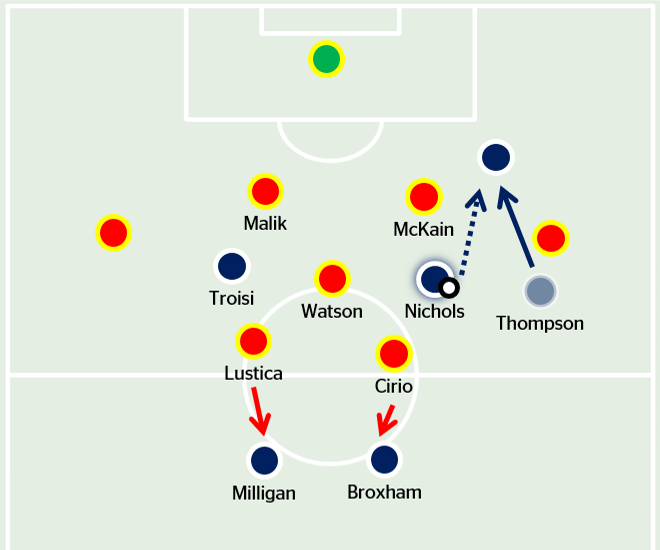 That left Watson on his own in front of the defence, and Nichols and Troisi frequently drifted into the pockets of space on either side of him to find space. Nichols was excellent in the first half and repeatedly found Thompson in behind, whereas Troisi was more inconsistent and was often caught pondering on the ball – that might be a consequence of the fact he’s trained less under Postecoglou, and therefore wouldn’t be as “up to grips” with the system as Nichols, who spent the entire pre-season at the Victory. 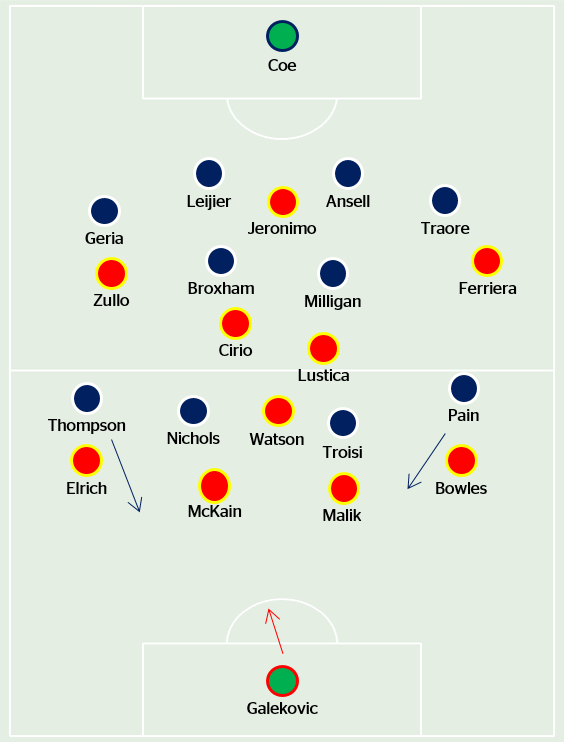 Of course, the by-effect of the midfield battle was that when Adelaide managed to play past Victory’s first line of pressure, it effectively took the front four out of the play and meant more room for the Adelaide attackers to find room in and around Milligan and Broxham. This was certainly obvious in the build-up to the admittedly dubious penalty. At the start of the second half, it seemed like Adelaide still hadn’t learn their lesson, when Thompson got in behind again (! ), but subsequently it became obvious that they were sitting a little deeper, a difference of ten yards or so. That was probably also a consequence of the Victory pressure: Postecoglou’s side dominated possession in the second half and launched waves and waves of attacks, best summed up by the difference between both teams’ passing statistics in the attacking third. With just seventeen passes in the final third during the second half, it’s obvious how Adelaide struggled to build momentum. The first substitution was Postecoglou’s introduction of Kosta Barbarouses for Pain – that saw Thompson switch to the left, where he continued to work the space in between Adelaide’s centre-backs and full-backs. Gombau was forced into another defensive reshuffle when Watson went off injured. Malik moved into midfield, and youngster Jordan Elsey played as a central defender. However, the key change came on seventy minutes, with the departure of Nick Ansell for Guilherme Finkler, and Broxham moving into central defence. That’ll probably be a common change for Postecoglou when Victory are chasing a game – the flexibility of Nichols, Milligan and Broxham makes it easy to add extra attacking spark. As it were, Finkler was outstanding, linking up play intelligently and timing his passes excellently to feed overlapping runs, as well as scoring the Victory’s first goal from a corner. On a sidenote, it’s worth noting that Postecoglou opted to move Broxham into defence, even though Milligan is more experienced in that position: it’s because the captain times his forward runs superbly, and the extra dimension he provides when arriving from deep positions gives the side an extra attacking threat that was missing against Melbourne Heart. The thumping long-range shot, well saved by Galekovic, illustrated this. Gombau later introduced Jake Barkier-Daish for Ferriera, but his most significant change was to allow Adelaide to sit deeper as the half progressed: they barely pressed the Victory, and had basically collapsed into a wall of nine players. Remarkably, the game was still all about the Victory getting players in behind Adelaide’s defenders, even as that space slowly decreased as Adelaide dropped deeper and deeper. Thompson hit the bar with five minutes to go, then in the ninety-first minute, his cross, from Finkler’s pass, was just overhit – before finally, with two minutes to go, Nichols got in behind the back four, and squared an excellent cross for Troisi to slam home the equaliser. An entertaining game, remarkable for its one recurring, definitive theme. Adelaide’s high line was practically suicidal: it played directly into Postecoglou’s hands, who had seen his side struggle to break down a deep defence last week, but thrived on the open spaces in behind the home side’s back four. The pre-match Fox Sports commentary about “other sides might emulate Adelaide” were ridiculously pre-emptive – and this game showed there is much work to do for Gombau. The much-feted dominance of possession wasn’t there, and they struggled to cope with the Victory’s early pressing. Furthermore, they couldn’t turn things around when under heavy duress in the second half. A good possession side would be able to get on the ball and calm the tempo down, but instead, Adelaide allowed the Victory to launch multiple attacks, leading rather inevitably to an equaliser.